This year Easter is April 21. As always, I am trying to come up with some new non-candy ideas for the boys' baskets. There are a few things that they always get: a small pack of jelly beans, a couple of Reese's eggs, and a book or two. I want to keep most if it to non-candy, especially since we still have orthodontics to deal with. In the past, they have received soccer gear (game socks, a practice net), books, art supplies, etc. I am still trying to come up with ideas. 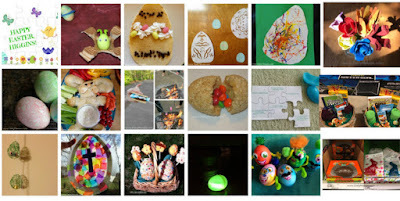 I have some of the food/craft/Easter basket and egg hunt ideas from the past couple of years below. Last Minute Easter Ideas: cheese puff filled carrot shaped bags, jelly bean bracelets, lollipop Egg Basket. Veggie Trays. I have an example of an Easter veggie tray towards the bottom of the linked post. Hidden Surprise Pound Cake: The link is for St. Patrick's Day, but if you change the shamrock to an egg or flower, it's perfect for Easter! 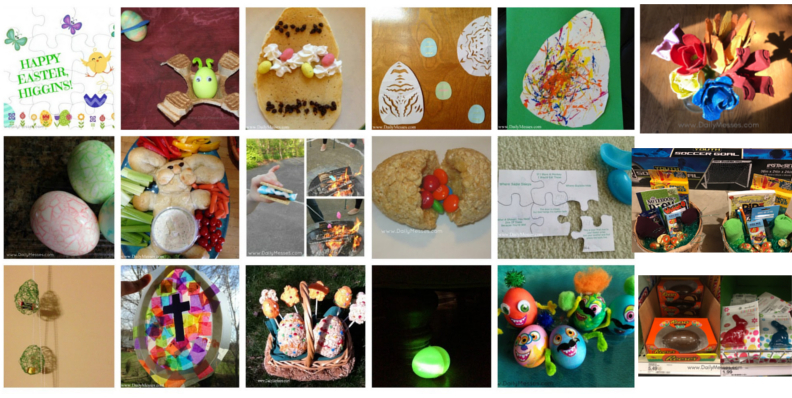 Egg dying and decorating: There are a lot of ways to decorate eggs, however we love to eat our eggs! So, I am only going to be doing ideas that leave the eggs edible. Drip Art Eggs: These look fun, but we haven't tried them yet. Stand a hard boiled egg upright over something that will not get ruined (like a plastic plate or bowl). Place a drop of food coloring on the top of the egg. Mist egg using a spray bottle. Add a drop of another color, mist again. Gently blow on the egg to make the colors move around. Tattoo Eggs: Use temporary tattoos. Make sure egg is completely dry before following tattoo directions. Ombre Eggs: Place a bottle cap (flat side down) on the bottom of a wide glass (8-10 oz.). Set egg on bottle cap. Mix the dye (1 teaspoon vinegar, 40 drops food coloring, 1/2 cup boiling water). Pour dye into glass until 1/4 of the egg is covered. Let sit 5 minutes. Add plain warm water to the cup until 1/2 the egg is covered. Let set 3 minutes. Add more water to the desired level. Wait 2 minutes. Repeat if want additional stripes. Carefully remove with tongs and let dry. Hunting for Easter Baskets. We do a scavenger hunt to find their baskets. Glow In The Dark Egg Hunt. New gear: soccer ball/cleats/shin guards/practice net, baseball cleats/balls/bats/bag/helmet/throw back, shoes: track/running, mouth guards, golf bag/balls/gloves/clubs, etc. Vouchers: Vouchers can be for anything! Examples: extra hour of TV/Game time, stay up late, get out of 1 chore, money to spend at a store/amusement park/zoo/aquarium, etc. Reese's Giant Peanut Butter Egg. Amazon sells these sometimes, but I have found them cheaper at the grocery store and Target. It was $5.49 at my local store. Large sized gummy treats. I found several at Target (gummy bunny 1.75 oz/$1.99), and Party City (Pizza, burger, sushi...$3.99). Lego's: Any fun looking set, mystery minifigure packs, Mixel's (Amazon, Lego). Lego usually has holiday themed sets as well. New weapons/Lego figures/crates. We found BrickArms a couple of years ago and the boys love discovering new weapons and figures for their Lego collection. This year, we bought a few different packs and are mixing up the contents and putting them in several Easter Eggs. Art/Office Supplies: pencils, pencil sharpeners, markers, tape, etc. DVD's. Half Price Books, Michael's Crafts, and Target often have cheaper movies. Hot Wheels. There are even some Hot Wheels that fit Lego figures! Books. Sometimes I use Easter themed books, sometimes just books in a series they love. My oldest is really into Uncle John's Bathroom Readers For Kids. It always surprises me when he says "Oh, I know this! ", adds to our conversation, and says he learned it from his Bathroom Reader. They even have sets of paper placemats, if you are having an Easter party and need to keep the kids busy! Art supplies (pencils/markers/crayons, how to books [there are a lot of instruction/how to books for kids and adults from easier instruction books to how to books for older kids]). Clay Pot Baskets. Super easy, cute, and works great as centerpieces. Marble Egg. Lots of fun and looks neat when it's done. After paint dries, cut out an egg shape to have a cool Easter egg! You could even cut out multiple smaller eggs to form garlands, napkin rings, place settings, etc. Egg Carton Flowers. Use the left over egg cartons and make some pretty decorations for Easter! Ikea has a free Easter Egg hunt. Some stores are having events this weekend (4/13), while some are having them next weekend, so please check the location finder on Ikea's website to see when your local store is having an event.